Mount St. Francis Cemetery provides the Sisters of St. Francis a pastoral interment site for religious sisters of this Roman Catholic order. It is located on private property at the intersection of Woodmen Road and Assisi Heights, on the grounds of the Mount St. Francis complex at 7665 Assisi Heights in far northwest Colorado Springs. According to GPS-derived geolocation (accurate to within 10 meters), the cemetery is located at 38°56'50.6"N and 104°52'12.4"W. This large religious complex is operated by the Sisters of St. Francis and consists of a parish church, retreat center, nursing home, counseling program, and administrative and retirement center for the sisters. Records for the cemetery are maintained in the administrative offices at (719) 598-5486. A 1971 extraction was published in the Colorado Genealogist, volume 33, page 102. The entrance to the cemetery is located on the left, just after turning onto Assisi Heights from Woodmen Road. The grounds offer a beautiful view of El Paso County, being located in the foothills of the Front Range of the Rocky Mountains high above Colorado Springs. The cemetery is in the shape of a rectangle bisected in the middle. The grounds of the cemetery are meticulously kept. The east end of the cemetery is currently being used for burials and consists of ten rows laid out east to west and up to 20 plots aligned north to south. 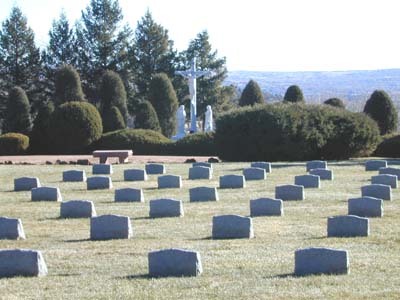 Row one is reserved for Provincials of the Sisters of St. Francis and contains four graves. The remaining 152 graves located in rows two through ten contain the remains of sisters of the order. The first burial occurred here in 1959, and the subsequent burials have generally taken place in chronological order according to the sequence of the rows and plots of the gravestones. It should be noted that in many instances, the first and middle names of the sisters buried here are not those given to them at birth. Instead, these records reflect names that were taken upon entering the religious order. The predominant German ancestry of the sisters is very evident when reviewing the surnames of those interred here.